Offering you a complete choice of products which include big bags. 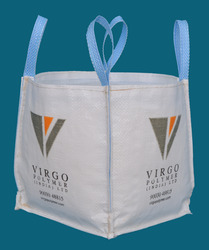 This type of Big Bags is generally used in general purpose of bulk packaging and is the most widely used FIBC. These bags have a comparatively better stability and stack-ability.These bags are either made in U 2 Design or also referred as U-Panel Jumbo Bags, U-Panel Bags or in 5 Panel construction. The four loops are fixed in the corners by over-lock sewing, chain sewing, or with a combination of both. The long seam at the edge of the bag gives a very good load distribution and guarantee high tenacity. Looking for Big Bags ?